After gaining 2523 rushing yards in three college seasons, Portis chose to enter the NFL draft following his junior year. The Broncos selected him in the second round and, while there were concerns about his lack of ideal size, he made up for it with his breakaway speed. Portis came on strong in the second half of the season on the way to setting a team rookie record for rushing yards and also showed ability as a receiver out of the backfield. Broncos went 9-7 to finish second in the AFC West. Portis achieved Pro Bowl recognition in 2003 as he rushed for 1591 yards, again averaging 5.5 yards per carry, and scoring 14 TDs. 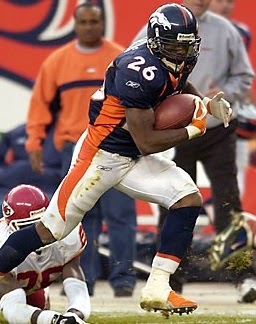 Bucking for a new contract after gaining 3099 yards in his first two seasons, he was sent to the Washington Redskins in a blockbuster trade for CB Champ Bailey. While Portis gained 1315 rushing yards in ’04, his average gain dropped to 3.8 yards, but he improved to 1516 yards and 4.3 yards per carry in 2005. Injuries limited him to eight games and 523 yards in ’06 and while he came back to gain 1262 yards on a league-leading 325 carries and caught a career-high 47 passes in 2007, he was showing signs of wear. A fast start in ’08 ended with a slow finish as Portis gained 1487 yards and was selected to the Pro Bowl for the second time. He played in just 13 games over the next two injury-riddled years, finishing up in 2010 with a total of 9923 yards on 2230 carries (4.4 avg.) and 247 catches for 2018 yards while scoring a total of 80 touchdowns.